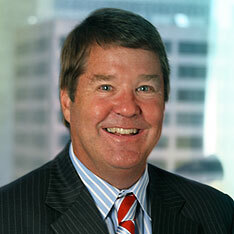 Patrick Smith is a partner in the Baltimore, MD office of DeHay & Elliston, L.L.P. His practice is entirely focused on civil litigation and he represents national, regional and local clients in toxic and mass tort and products liability litigation, commercial litigation, personal injury litigation and securities class action/shareholder litigation. He has extensive experience in complex litigation. Mr. Smith is a honors graduate of Georgetown University in Washington, D.C., graduating there in 1976 with a degree in government and political science. He was elected to Pi Sigma Alpha, the National Political Science Honors Fraternity. Mr. Smith received his Juris Doctor degree with honors from the University of Maryland School of Law in 1979. Mr. Smith was a member of the U.S Army Judge Advocate General’s Corps and served on active duty from 1981 until 1984 at Fort Jackson, SC where he traveled across the Southeast US trying many court-martials as both a prosecutor and as a Senior Defense Counsel. His past legal positions also include being an Assistant Attorney General for the State of Maryland representing the State Insurance Division and Group Counsel with the United States Fidelity and Guaranty Insurance Company. He was a partner with the Baltimore law firms of Whiteford, Taylor & Preston and Church & Houff, PA and managed the Towson, MD offices of the law firms of Rubin & Rubin, Chartered and Powers & Frost L.L.P. Mr. Smith holds the highest AV rating from Martindale Hubbell.